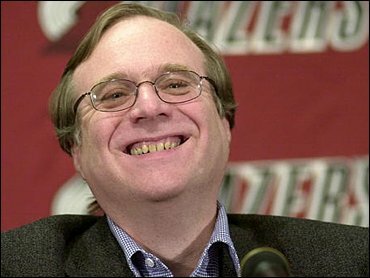 Paul Allen’s Interval Licensing sued a bevy of technology companies including AOL, Apple, eBay, Facebook, Google, Netflix and others for patent infringement. AOL, Apple, eBay, Google, Netflix, Office Depot, OfficeMax, Staples, Yahoo, and YouTube's acts of infringement have caused damage to Interval, and Interval is entitled to recover from Defendants the damages sustained by Interval as a result of Defendants' wrongful acts in an amount subject to proof at trial. For example, Interval Research served as an outside collaborator to and provided research funding for Sergey Brin and Lawrence Page's research that resulted in Google. 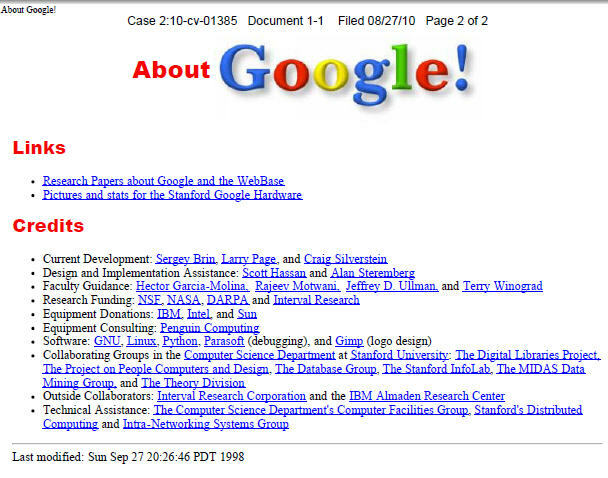 Indeed, a Google screenshot dated September 27, 1998 entitled "About Google!" identifies Interval Research in the "Credits" section as one of two "Outside Collaborators" and one of four sources of "Research Funding" for Google. See Sept. 27, 1998 Website "About Google!" attached as Exhibit 1. Mr. Brin and Mr. Page also recognized Interval Research's funding in the "Acknowledgements" section of their 1998 research article entitled "Anatomy of a Large-Scale Hypertextual Web Search Engine" in which they "present Google."